We get on our feet for a second HTC Vive hands-on. We're roughly two months away from the HTC Vive’s launch and details are still distressingly scarce. How much will the thing cost? How much space do I really need in order to set it up? Has Valve’s involvement and the SteamVR branding helped draw in developers? Does this thing have games ready for its debut? How many units will actually ship in November? All valid questions, and ones I hope we learn the answer to soon. And yet—and yet—all those worries faded to the back of my mind recently when I got the chance to go hands-on with the Vive a second (and third) time. Why? Because there’s one thing I’m sure of, regardless of the above answers: The HTC Vive is still the most impressive virtual reality tech currently coming to market. A caveat: I don’t necessarily mean it’s the best consumer product. That designation is still extremely dependent on some of the aforementioned questions—price being the number one issue facing virtual reality at the moment. Set all that aside, though. Taken in pure isolation, the HTC Vive is incredible. I’d begun to have doubts, to worry my memory was skewed. 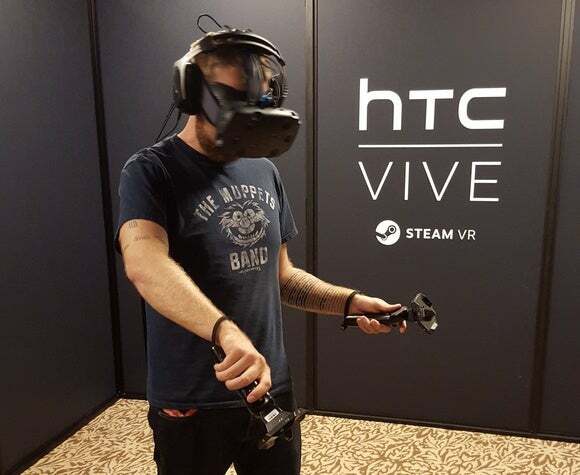 The last time I used the HTC Vive was back at GDC. That was in March, six months ago, and at the time the Vive was a hokey prototype that required me to belt a bunch of cables around my waist—although it was still enough for me to claim Oculus had been “dethroned” as the VR frontrunner. 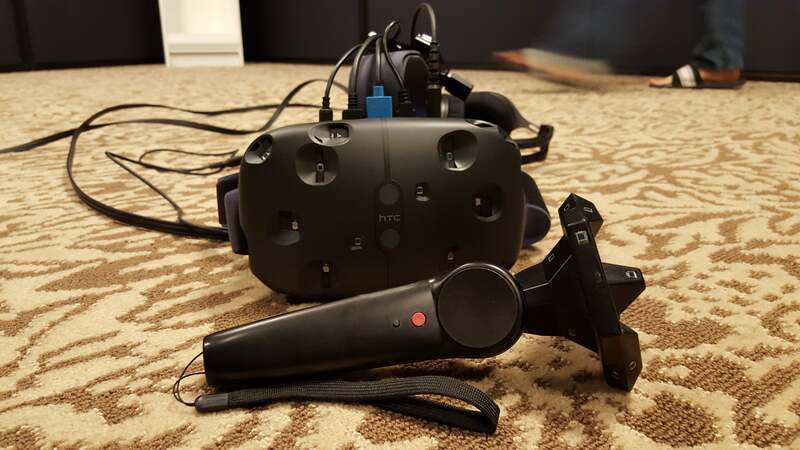 This is the HTC Vive as it looks in September, 2015. It’s less of a prototype than before. Pardon the carpet. Six months is a long time in a fledgling field like VR however, and a lot’s happened since that first Vive demo. Oculus unveiled its full consumer model Rift and even debuted Oculus Touch, two hand-tracking controllers similar to the Vive’s utilitarian wands. And both are great. 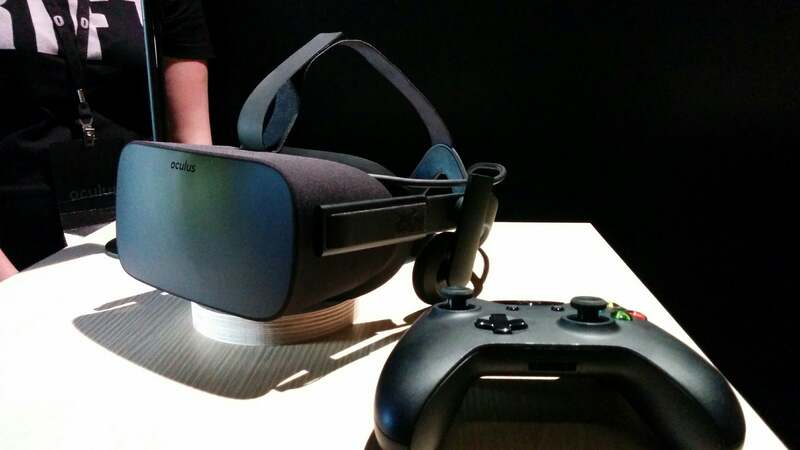 The consumer Rift is a logical progression from the second dev kit and the Crescent Bay prototype, and I had a hell of a time with Oculus Touch at E3. In short: The Oculus Rift will probably (barring catastrophe) be a great virtual reality headset, and all signs point to it coming in quite a bit cheaper than the HTC Vive—important if the technology is to reach critical mass with consumers. But the HTC Vive is still better. Six months ago, cordoned off in a blank white room with the HTC Vive, I got my first official taste of walking-around-VR. 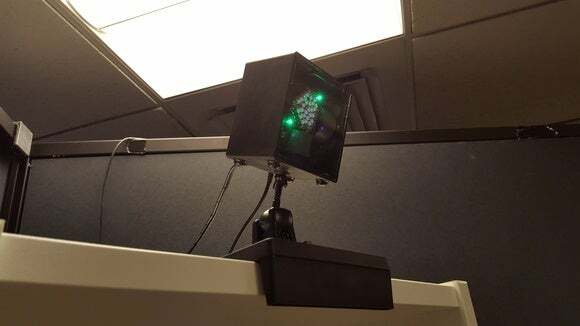 The system makes use of two base stations (designated “Lighthouse”) which tracks both your position and two controllers within a fifteen-by-fifteen foot area. Within that space you can do whatever you want. The Oculus, by contrast, tracks your position in a much a smaller area—perfect for sitting in front of a computer (or, at best, standing relatively still in front of the same desk). People have cobbled together walking-around-VR for the Rift, primarily by hacking a Kinect into games, but it’s not officially supported as yet. The Rift and its position-tracking sensor are designed for desk (short-range) use. That’s a shame, because walking-around-VR makes for more interesting experiences. Not everything I’ve played on the Vive has been perfect—some of it has been downright gimmicky—and I know there will inevitably be people who either won’t or can’t play games standing up. Both are fair. The things I’ve done, though. Fantastic Contraption. You might recognize the name from both the popular Flash game and, later, the similarly-revered mobile game. It’s like a slightly-less-goofy version of The Incredible Machine. Using tubes and wheels you build a vehicle to convey a pink ball into a pink “Victory!” zone, with each level adding new obstacles. Now imagine that game in virtual reality. Instead of pixels on a screen you’re building vehicles with rods the length of your arm, with wheels the size of a collie. Vehicles six-feet-tall that squeak and squeal as they trundle down the track because they’re seemingly made from balloons. And all your building materials are housed on the back of a floating cat that you can pick up and toss around. It’s one of the best gaming experiences I’ve had in 2015, and it was only two levels long—one to get me used to the controls, one to let me build something crazy. I could’ve played it for hours, attaching balloon rods to balloon wheels in all sorts of configurations. The first thing I wanted to do as soon as I left was see if I could build a massive balloon tank. Honestly, I think you could. And yeah, it would work with the Oculus Rift. It could work with both Oculus Touch and the less-intuitive-for-VR Xbox controller. There’s something about the Vive, though. There’s something about standing up, walking around your silly vehicle, seeing where you forgot to connect two axes so your whole vehicle falls over halfway down the track, kneeling down, and attaching a new rod. The biggest problem with the HTC Vive? The experience requires you find a place for two of these Lighthouse stations. Somewhere high. This is going to sound stupid, maybe—especially to the VR naysayers. But I didn’t feel like I was playing a game. When I think back on those moments with Fantastic Contraption, it’s not the same way I think back on playing Metal Gear Solid V, for instance. It’s not like seeing a game on a screen. It’s like for five minutes I was actually a weird balloon mechanic constructing my latest squeaky masterpiece. I’ve had similar feelings in Rift games, but without being able to walk around the scope is more muted. The effect is best on the Rift with cockpit games—driving, flying, piloting a mech, what-have-you. The Vive merely opens up more avenues for both players and developers. It’s a far cry from dreams of Star Trek’s Holodeck, but it’s…closer. The limitations are glaringly clear in something like The Gallery: Six Elements, an adventure game from developer CloudHead. Here, I realized that fifteen feet by fifteen feet is…still not a very large area. And in an adventure game, this meant CloudHead needed a stopgap solution: Like the ol’ HyperCard days of Myst, the player basically teleports from area to area. I’d look where I wanted to go, press a button, and I was there. And yeah, the system’s sort of busted at times. It’s a bit too easy to get lost or turned around, and people who play a lot of video games would probably feel just as comfortable playing on the Rift with an Xbox 360 controller. I doubt they’d get the full effect, though. There are moments in The Gallery that have stuck with me—standing around a beach bonfire, shooting off Roman candles. Standing in front of a table strewn with papers and half-deciphered bits of Morse code. Firing off a flare gun. These moments are by-and-large dependent on the fact I felt like I was actually wandering the space, even with the reality-breaking conceit of teleporting between zones of exploration. It’s little more than a clumsy, groping glimpse at what the HTC Vive could do, but it’s a compelling glimpse. I’ve seen a lot of VR demos in the last two or three years, a lot of half-baked proofs of concept and some that were more refined. I don’t pretend to know what the future holds for virtual reality, but I like to think I (on occasion) recognize where it should go, what developers should be looking into, what’s really interesting. Or at least where it should go in a perfect world where market forces are no object and consumers aren’t inherently fickle. The HTC Vive is the most compelling device in consumer virtual reality, at the moment. Whether it’s feasible? Whether it gains developer support? All those other questions at the top of the article? Those are all realities of the business, and may ensure the Vive never takes off. The space demands are preposterous, the cost most likely outrageous, the adoption base potentially too niche for developers to take seriously. It’s a pipe dream inside a pipe dream—I’m not even sure virtual reality will survive the next few years, let alone its more-expensive variant. But damn it, I can dream—of six-foot-tall balloon tanks and walks on abandoned beaches and dumping sriracha on virtual steaks.